This was written by me (Simon Thackeray of White Oak Aikido Reading) without any intention to make any claims as to accuracy or it being any version of a 'complete and true' UK Aikido history. It is based on my own memories of events, written information that I have and my memory of what I have been told. Lots of Aikido people and lots of Aikido events have been omitted because this is only about people and events that interacted with my own development in Aikido and that of White Oak Aikido and Reading University Aikido, so it is all very much written from my own perspective and only includes what I want to and what I remember right now as I write it. However, if you think anything is seriously inaccurate as opposed to being omitted, then please let me know! Alternatively, for the options for martial arts training in Reading, Berkshire today, just follow that link. 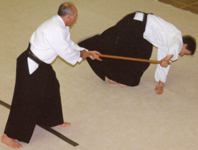 Below is a section on Ron Russell Sensei - you can use the following links to go to Foster Sensei, Hamish McFarlane, Andy Allan, Fiona Bain and some information on the history of Aikido at Reading University. Saito Sensei and Iwama Aikido were strong influences on my Aikido, so you can also see more about that here. He started Judo at The Hut in 1962 and originally started Aikido to improve his Judo. He emigrated to New Zealand in 1978 and was teaching Aikido there but returned to the UK in 1991, teaching at The Hut and attending the Aikido Summer School. He was graded to 4th Dan in 1986 and 5th Dan in March 1993. I really only knew him for a brief period during the early 1990s, having the opportunity to practise Aikido with him at The Hut. He was totally immovable if I made any attempt to force any technique on, so he taught me a lot about how not to use strength. He was very appreciative of the effort I put into running Summer School. Both his elbows had suffered from Shihonage and he once cracked his pelvis when demonstrating how not to receive a technique. Famed for being able to do ukemi over a Mini in The Hut car park! He died in 1994, having returned to New Zealand in August 1993. "You start it, I'll finish it." "It's never boring in the dojo." On answering the question: How many people were at Aikido training? "Always count the instructor, it sounds better". "Everyone these days wants to be taught everything rather than study it." Info for Beginners at White Oak Aikido Reading - some more details about the Aikido clubs and what to expect if you come along. Aikido Training Times and venues for the Aikido clubs at Reading YMCA and Caversham Heights Methodist Church Hall. Joining White Oak Aikido Reading. Or please Contact us if you have any questions about Aikido or the club. ...and here's some pages about Aikido in the past. Chi Gung (Qi Gong) classes in Basingstoke and Caversham, Reading. 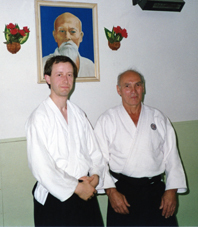 Ron Russell Sensei at The Hut dojo in 1993. 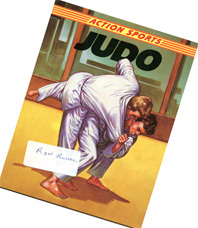 Judo book - a present from Ron Russell Sensei. Ron Russell Sensei throwing with the jo.